But that pattern of migration is changing, as rapidly rising temperatures have led to earlier springs in the Arctic. So Nolet’s team tracked dozens of barnacle geese to figure out how they are being impacted by the earlier snowmelts. Their results were published in a new study in Current Biology. One big thing hasn’t changed: what time of year the geese start heading north. And that’s a problem. These days, the weather in parts of the journey north is warmer than it used to be and the birds seem to realize that they’re running late. They start to speed up — a lot. 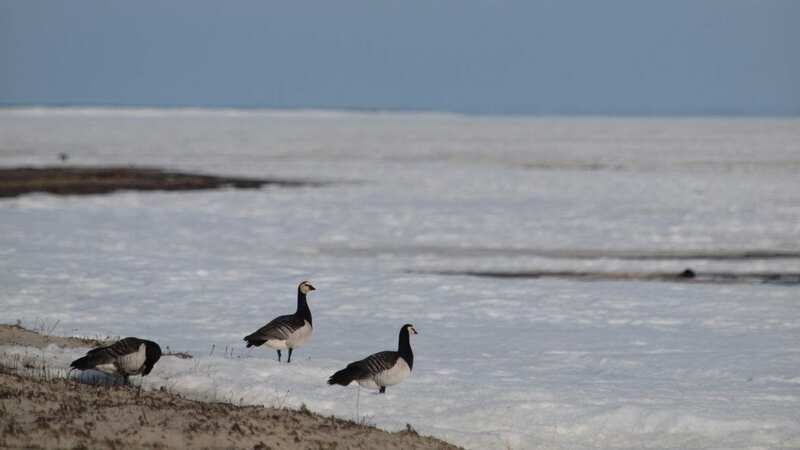 A journey that usually takes the barnacle geese a month now takes about a week, the researchers found. It’s a marathon: “They fly nearly nonstop from the wintering areas to their breeding grounds,” Nolet says. Even though they make up time on the way, the exhausted geese can’t lay eggs right away because they need time to forage and recover — some 10 more days. In short, rising Arctic temperatures mean that migratory barnacle geese are out of sync with some of their best food sources, which means that fewer of their chicks are surviving their early months. So why don’t the birds just set off earlier for their journey north? Nolet says they think this species likely takes its cue to leave based on how long the daylight hours last, rather than the temperature some 1,800 miles away. But the future of the barnacle goose may depend on its ability to adapt to the new reality and set off earlier. Luckily, Nolet says, the bird is a “flexible” species that travels in groups, making it more likely that if a few start leaving earlier, others will follow. Generally, climate change is likely to create this kind of mismatch for animals that migrate long distances. It’s harder for them to adjust, Nolet says, when they spend part of the year in a totally different climate.